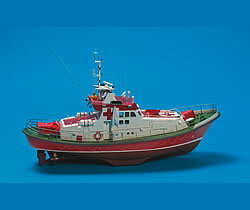 Billings Boats BIL430 Emile Robin 1/33 scale ABS hull model kit! This lifeboat was named after the Parisian merchant Emile Robin, a philanthropist, cognac manufacturer and vice-president of the French charity La Societe Centrale de Sauvetage des Naufrages (Society for the Salvation of Shipwrecks). Emile Robin is one of the most important benefactors in the 150 year history of the Danish Lifeboat Service. MRB 20 “Emile Robin” is permanently stationed at the lifeboat station in Hvide Sande, on the western coast of Denmark.